If you are really serious about fitness, you need to workout all your muscles and toned them for building strength and flexibility. Adductor brevis muscles are an important part of adductor muscles which play an important role in building flexibility and strength. There are a few exercises which specially focus on these muscles and help in toning them. These exercises work by improving the blood circulation, help in perfect cushioning of the muscles and also reduce the risk of injuries. You need to include at least one of the below exercises in your regular workout schedule. Leg lifts are a popular workout and quite common among the beginners too. This exercise helps in toning the adductor muscles. Start by lying down on the right side. You need to prop your right elbow just under the right shoulder. You need to rest the head on the palm. Now, slowly place your legs and again align your body in a comfortable straight line. You can bend the left leg and you can again place the left foot on ground, just in front of the right leg. Now, slowly move your leg at least three inches from the ground. You can again lower the leg and get back to start position. You can continue the movement till the thigh muscles start burning. You can then switch your sides and begin. If you wish to make the workout more challenging, you can add some weight to your ankle. This is an easy exercise which helps in toning thigh muscles. It also builds strength and adds power to your lower back muscles. You need a weighted object for the workout. Lie down on your back. Legs will be bent and your feet on ground just under knees. You can widen the feet and then place one ball just between the thighs. You can again tighten the abdominal muscles as you squeeze the stomach muscles. It is quite like believing that you are balancing a grape on the belly button. You need to press the thighs well against the ball. You can also move the glutes from the ground. You will stop when the shoulders, your knees and lower back form a straight line. Stay in this position for at least 30 seconds. If you feel uncomfortable or a burning sensation in the thighs, you can stop. You can do this workout daily. You need to attach one ankle strap with a cable pulley machine. You will then wrap this just around the leg. You will stand comfortably, as your feet is shoulder distance apart. You can keep your left hand on one sturdy object for some additional support. You will move your right leg from the ground and move it a little away from the body. You can stop just as the hip rises so that you are able to adjust the lifting motion. As you keep your leg straight, you will slowly move your leg down and move it just across the left leg. Your feet shall be above the floor in such a position. You need to do this workout at least ten times using your right leg. You can again switch your sides and repeat the workout using the left leg. This workout helps in strengthening the adductor muscles amazingly. Straighten your back and stand near a workout bench. Keep your knees bend and abdominal muscles tight. With your right foot step on the bench. You will also push well through the right heel and stand on the bench straight. Your left foot shall be close to the right. Again step the left foot back and move towards the ground. You will then move the right foot. Now, again move the left foot first and then right foot. You will step down using the right foot and then the left foot. Continue till you get back to the start position and keep alternating the leg movements in this way. You can repeat as many times as you can. 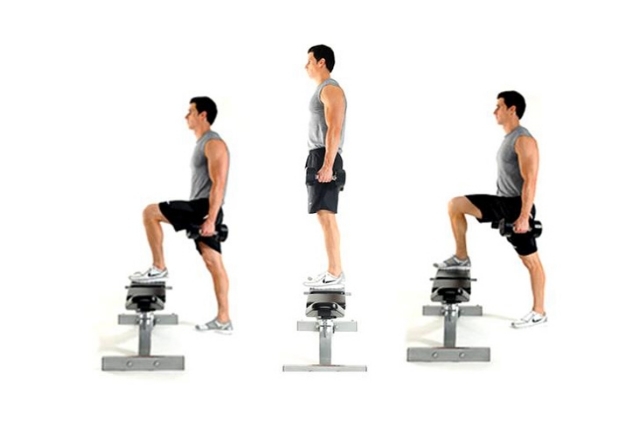 In case you are not able to maintain a good form, you can change the bench and use a shorter one. Stand as your feet are a little distance apart. Your hips and knees shall be a bit bent. Your hips and knees shall be slightly bent as you keep the back straight. With the left leg, you need to step out a bit. You will again bring the right leg close to it and get back to the start position. You will slowly pick the pace and move from one room to another, as your knees are kept bent. You will be working out the inner thighs in this position. Repeat at least 10-12 times.